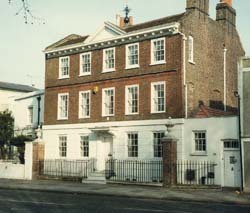 Orme House is at 4 Church Street, Hampton. It is a three-storey brick house, built early in the 18th century. A central pediment was added after 1920. Thomas Holloway (1748-1827) engraver of Raphael cartoons.